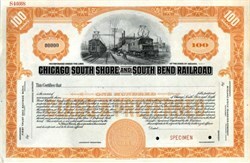 eautifully engraved specimen stock certificate from the Chicago South Shore and South Bend Railroad printed in the 1920's. This historic document was printed by the American Banknote Company and has an ornate border around it with a vignette of 2 electric trains. The South Shore Line, America's last electric interurban railroad, was originally built in 1908 as the Chicago, Lake Shore & South Bend Railroad. In 1925 it became part of Samuel Insull's transportation and utilities empire and was renamed the Chicago, South Shore & South Bend Railroad. After Insull's empire collapsed during the Great Depression, the CSS&SB outlasted the other interurbans with the help of significant freight revenues, and survived into the era of government subsidies. The portion of the line in Indiana is now owned by the Northern Indiana Commuter Transportation District, which operates passenger service and grants a franchise for freight traffic to the Chicago SouthShore and South Bend Railroad. All freight service is now hauled by diesel locomotives. In 1881 at the age of 22, Samuel Insull became the private secretary of Thomas Edison. And within a few years, he worked his way up to manager of Edison's factory in Schenectady, New York, which in 1892 became General Electric. In 1892, Insull came to Chicago to become president of Chicago Edison, an electric power company. And in 1907, he merged Chicago Edison with Commonwealth Electric, forming Commonwealth Edison, Chicago's present electric utility. In 1912, Insull formed the Middle West Utilities Co., a holding company which eventually acquired several electric railways and utilities in Indiana. In 1924, the holding company became Midland Utilities Co., and in 1929 became Midland United Co. In addition, Insull continued to control Commonwealth Edison, and acquired three electric railways operating in Chicago and northern Illinois.